Now that Arrested Development has run its course, Will Arnett, who played Gob on the show, finds his schedule jam-packed with projects. 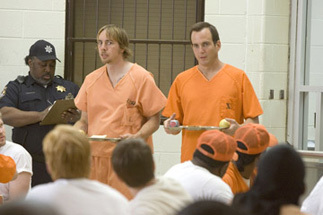 The first one to see theatrical release is Let's Go to Prison, which puts him opposite the very funny and underrated Dax Shepard in Bob Odenkirk-directed effort. Shepard plays a felon named John Lyshitski, a guy who has figured out the perfect way to exact revenge on the judge who sent him to jail. When that judge's obnoxious son, Nelson Biederman IV is wrongly convicted of a crime, John gleefully agrees to become Nelson's cellmate and introduce him to all the glorious ins and outs of prison life. Almost immediately, Nelson offends the wrong people and John "sells" his cellmate to Barry (Chi McBride) for some quality snuggle time. See the latest developments for this project on the Let's Go to Prison Movie News page.